Power bowls are the bomb. While they’re available in many health-conscious cafes and restaurants, you can create power bowl recipes at home for a fraction of the cost! One of the awesome things about power bowls is you can have one for breakfast, lunch or dinner, and they’re one of the easiest meals to make. With so many nutrients and good-for-you ingredients, they keep you full and energized throughout the day, and are known to help you lose weight! 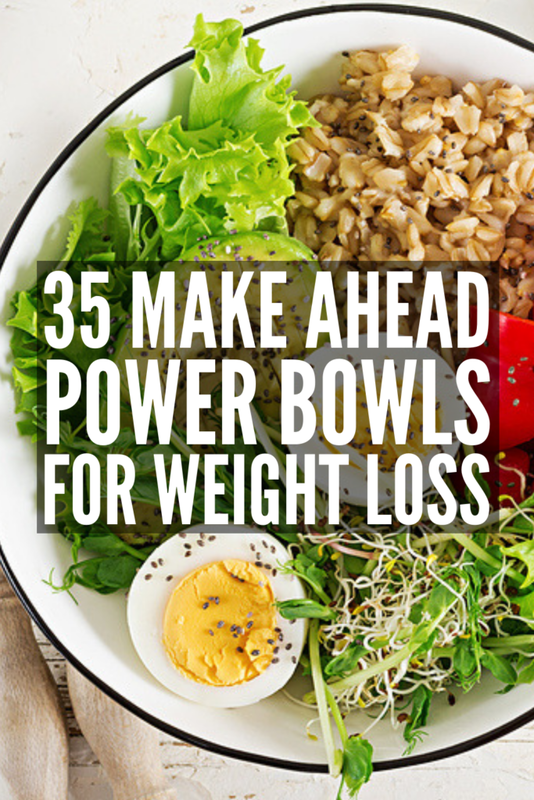 Wondering what all the hype is about power bowls? Take a look at 35 power bowl recipes you can make for every meal. Power bowls are healthy, filling bowls chock full of various greens, raw or roasted veggies, beans, healthy fats, protein like chicken or tofu, and a healthy grain like quinoa or brown rice. With power bowls, you don’t have to sacrifice on flavour for a healthy meal – they’re packed with nutrients to keep you going throughout the day and are exceptionally delicious. They’re the perfect mix of everything you need to fuel your day, and you can customize them with your favourite ingredients! Plus, with so many good-for-you ingredients, they’re known to help aid weight loss and keep you on track with your weight loss goals. Every power bowl has a base! Choose from ingredients like lettuce, spring mix, arugula, kale, spinach, brown rice or quinoa. Try to eat in season and organic as much as possible, and use a big handful or at least one cup raw (before cooking) for your base! Next you’ll want to add some staying power in the form of starchy, healthy carbohydrates. Use about half a cup of one or a mixture of carrots, beets, sweet potatoes, parsnips, squash or taro. One cup of veggies or fruits comes next! Choose your favourite vegetables for your power bowl. These could be anything from steamed or roasted asparagus, cabbage, cauliflower, cucumber, eggplant, tomatoes, green beans, onions, peppers, zucchini…you get the picture! If you’re making a breakfast power bowl, you can also add fruits like berries to the mix. Protein is an essential part of a power bowl since it will fill you up and keep you satisfied for longer. This will keep you from snacking and reaching for bad-for-you foods in a mid-morning or afternoon slump. Power your bowl up with protein like eggs, fish (salmon, tuna, cod, shrimp, scallops, etc. ), meat (chicken, beef, turkey, pork, lamb, etc.) or tofu. Healthy fats are so good for you and are an important part of a healthy power bowl. Some great options for healthy fats are avocado, coconut, nuts, olives, seeds, tahini and nut butters. Not everyone likes dressing on their power bowls, but if you do, some options are: a balsamic vinaigrette, spicy peanut dressing, greek vinaigrette, cumin lime dressing, or of course you can make your own concoction. If you want additional flavour boosters, you don’t have to stop there. You can add ingredients like fermented veggies, bone broth, salsa, spices and hot sauce to give your power bowl an extra flavourful boost! Many people like to have meal prep day on Sunday. This allows you to get ahead of the week and have meals prepared for each day. This way you’re not scrambling and overwhelmed making lunches in the morning or getting dinner ready at night. Set aside a day to do your grocery shopping and meal prep for the week ahead. Plan out your power bowls for the week ahead. This ensures you know which ingredients you’ll need to create your bowls, what you have in your fridge and pantry and what you need to grab at the grocery store. Being prepared is the ultimate way to keep your healthy eating on track. Organic, pre-washed greens are ideal because they come ready to throw in a bowl at any time. If you’re really in a pinch, having these pre-washed greens will allow you to put together a power bowl easily and quickly! Once you know what bowls you’re going to be making and have all the ingredients, it’s time to prep, cook and portion the ingredients. Wash and chop your veggies, rinse canned beans, cook up lentils or shelled edamame, boil some eggs, and then portion things out. Organize the fridge, freeze any leftovers and prepare whatever you can beforehand for the week! There’s nothing better than a healthy power bowl to fuel your day! Whip up these power bowl recipes when you need a delicious and satisfying meal! If you loved this post on easy power bowl recipes, make sure to share it on Pinterest! And if you want more healthy recipe ideas, make sure to follow our Food Board on Pinterest!